The lunar terminator of the waxing gibbous Moon at 2017-03-15 05:35 UT from Austin, Texas. Questar 3.5" telescope with Sony a6300 at prime focus. Exposed 1/30 sec at ISO 100 at f14. The best 10 of 89 images stacked and deconvolved in Lynkeos. Final crop and exposure adjustment in Photoshop. Callisto, Ganymede, Europa, Jupiter, and Io (L to R); taken from Austin Texas on 2017-03-15 05:57 UT. 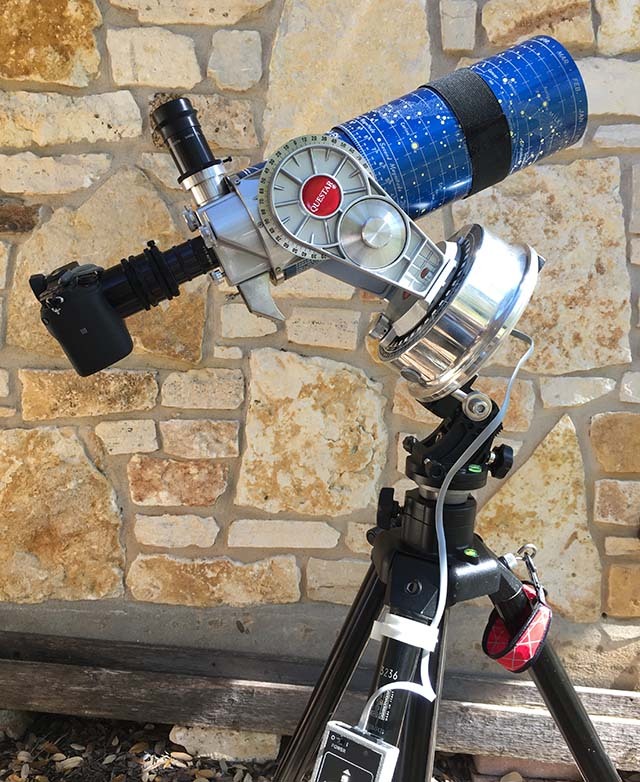 A Questar 3.5" telescope with 2x2x Dakin Barlow lenses and a Sony a6300 camera. Focal length approximately 5200mm, f56. 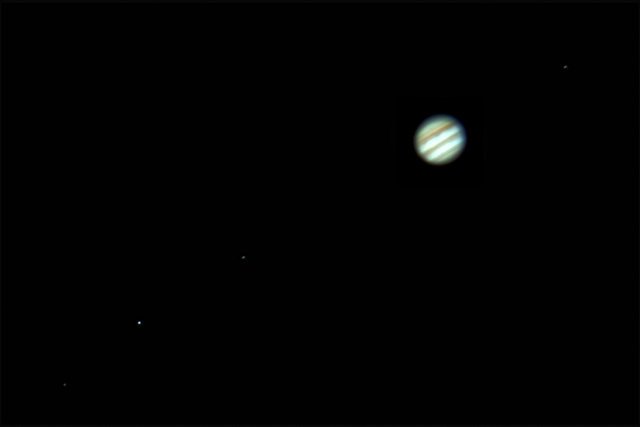 Jupiter best 603 of 2725 frames taken from 90" of 4k UHD 30fps video exposed 1/30 sec at ISO 800. Moons best 8 of 24 still images exposed 1 sec at ISO 800. Images stacked and deconvolved in Lynkeos with final compositing, crop, and exposure adjustment in Photoshop. I've been happy with the wooden wedge that I designed and built. Living with it for several years I also found a couple of disadvantages: the lack of fine control in azimuth adjustment, and its overall bulk. 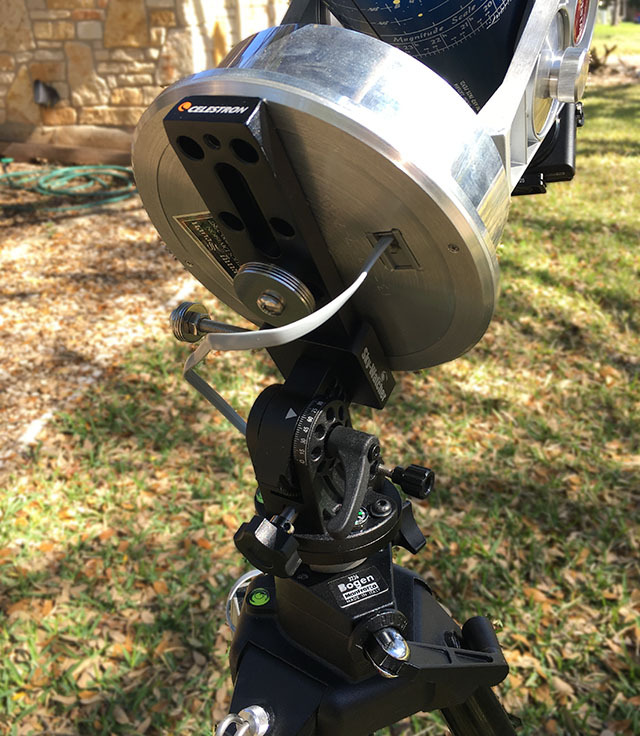 A while back a friend showed me how well the inexpensive Skywatcher Star Adventurer Equatorial Wedge worked with the Questar. I also needed a stiffer tripod for use with my Vixen Polarie star tracking mount and the camera. I decided to try a stiffer tripod with the Questar and Skywatcher wedge, and use my Davis & Sanford compact tripod with the Polarie. If this works, I can upgrade tripods for both nightscapes and telescope images with one purchase. A good price on a lightly used Manfrotto 3236 tripod gave me a chance to try out this package with the Questar. The 3265 weighs about 9 lbs, almost 50% more than the D&S. This pays off in a substantially more stable platform. With Barlow lenses on the Questar for a 5200mm focal length, The D&S and wooden wedge would settle down from a tap to the telescope within a couple of seconds. The Manfrotto and Skywatcher wedge combo settles down in about 1 second. This improvement makes focusing easier than before. The fine screw adjustment for azimuth, makes polar alignment faster as I hoped. I cut down a Celestron dovetail to fit the Questar base. The dovetail supports the Questar solidly and let's me balance the telescope's weight near the center axis of the tripod. This wedge is an accessory to the Star Adventurer mount for cameras and small telescopes. I have not found individual specifications for this part. However, the motorized mount is rated for 11 lbs and weighs 2.2 lbs, so the wedge must be designed for a load of more than 13 lbs. The Questar with a heavy camera and counterweight will run about 10 lbs. In practice this wedge provides very solid support for the Questar and the fine adjustments work well under load. A heavier duty alternative is something like the Astrotrac TW3100 Wedge which can handle a 33 lb load. The Astrotrac wedge runs around $400 new compared to the $69 Skywatcher wedge. A compact wedge like the Skywatcher or Astrotrac adds very little cross section to the telescope's profile in the wind; much less sail than my wooden wedge. I expect much steadier images when the wind is blowing with the new setup. Although the D&S Compact tripod has a load rating of 30 lbs compared to the Manfrotto's 26 lbs, the Manfrotto is about twice as stiff with the same load. I attribute this stiffness to: the circular cross section of the legs which are stiffer than the rectangular D&S legs and a bit heavier duty hardware on the Manfrotto. The Manfrotto also has a geared center column; which I do not plan to use to maximize stiffness. I like the feet on the D&S tripod. A simple metal design that flips between a flat and spiked profile. The Manfroto uses more conventional screw down rubber feet that cover a central spike. I find these slower to adjust and more trouble to keep clean. I've added a note with details of how I replaced the dovetail clamp knob and fitted the dovetail bar to the Questar.